Drawing and painting have been part of my life for as long as I can remember. 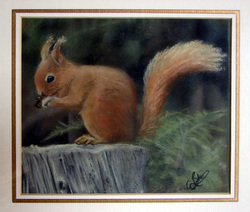 Surprisingly, some of my early scribblings still exist, including my very first pastel piece of a red squirrel, painted at age 14. During the 1990s I made a modest living from signwriting, canal art, handmade greetings cards and pen & link notelet sets whilst travelling the English canals on a narrowboat. In 1998 I moved onto dry land, and since then have pursued other careers including managing my husband's Russian motorcycle business, dog behaviour and training, and yoga teaching. In June 2012 I made the decision to return to art again, on the realisation that if anyone asked me in years to come if I had any regrets, it would be that I never found the time to paint. So here I am, doing what I love, in between 'proper' jobs and studying for a BA (Hons) in Criminology and Criminal Justice. What I enjoy creating most is animal portraits. My favourite medium is and always has been soft pastel, which is superb for creating touchable-looking fur and feathers. One of my dog portraits gained a 'Special Recognition' award in the July 2012 Light, Space & Time 'Animals' competition. With animals being my favourite subject for painting, it feels only right that I should try and use my art to benefit pets and wildlife conservation. I regularly donate pieces of artwork to pet rescue charities for auctions and prizes, and my British bird prints are sold in aid of the RSPB. For a more interactive experience and to see works in progress, please visit my facebook page.